Wayne State University Press, 9780814334713, 168pp. Though many Union soldiers wrote about their experiences in the American Civil War, few had the vantage point of William Horton Kimball, a member of the First Michigan Engineers and Mechanics. As a military engineer, Kimball spent most of his time behind the major lines of conflict and often worked among civilians who sympathized with the enemy. 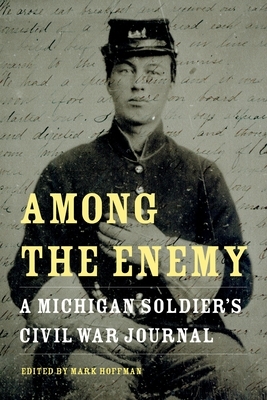 In Among the Enemy: A Michigan Soldier's Civil War Journal, author Mark Hoffman presents Kimball's journal as a unique window into wartime experience. Kimball was a prolific writer, and his journal is full of detailed accounts of expeditions into a hostile countryside, the bitter war against guerillas, and of the civilians caught in the middle of a traditional war waged with nontraditional means. He comments freely and openly on the strengths and weaknesses of his officers and comrades caught up in the same war. At the same time, Kimball provides moving accounts of when the Engineers were thrown into the line of battle at Perryville and Lavergne and proved themselves as soldiers capable of traditional combat. Through Kimball's account, readers can chart the important evolution of Union war policy regarding occupied populations, as well as how the American views of warfare broke down when combat moved from battlefield to countryside and soldiers in the rear became important targets for enemy action. Civil War historian Mark Hoffman introduces Kimball's writings and provides some background on Kimball's life as a soldier. He accompanies the journal entries with illustrations and maps. Kimball's account reminds readers that there was a time when Americans who honored the same founders and national holidays were seeking to kill each other in a bitter war behind the lines of traditional armies. Readers interested in military history and the Civil War will enjoy the inside perspective of Among the Enemy. Mark Hoffman is a lifelong student of the Civil War. He previously wrote the award-winning My Brave Mechanics: The First Michigan Engineers and Their Civil War (Wayne State University Press, 2007).